Build relationships and expand your coaching circle with FastDraw’s FastTrade feature as a networking tool. No matter what industry you work in, networking is crucial to success. The coaching business is no different. Relationships matter and those who have have a solid network are in better shape to succeed than those who don’t. But we’ve all been there and experienced the awkwardness that can come from reaching out to someone when trying to build your professional network. You don’t know them, they don’t know you – but it’s evident that it would be mutually beneficial for the two of you to connect. How do you reach out? FastTrade makes sharing easy – click for a step-by-step guide. All you need is an ice breaker… and we know the perfect one: FastTrade! 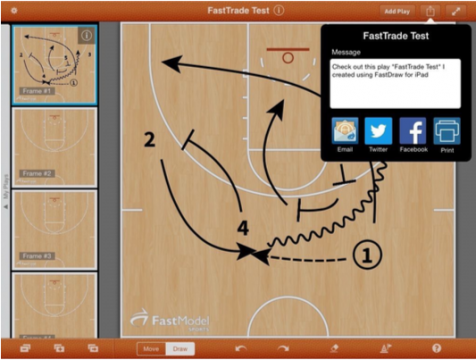 This simple, built in feature of FastDraw, your favorite basketball play diagramming program, allows you to send any plays, drills or even full playbooks directly to another FastDraw user’s library or via email to a non-user (But if they’re not using FastDraw, do you really want to be friends with them?? Are they even a serous coach??). Now, hand written cards will always be great for a personal touch – but who has the time for that? Instead of sending the generic email/text/DM, try something new. Use FastTrade to accomplish multiple objectives at once: introduce yourself, demonstrate expertise and provide something valuable to your potential new connection. Think of how much more impactful it would be to receive a message like this! The receiver will get an email as well as the content in their FastTrade manager inbox. On one hand, it can be easy to make new connections in basketball due to the mutual respect coaches have for each other and the craft of coaching. It’s a unique business where coaches share a bond with their peers even when they don’t know each other – mostly because of the understanding of what it takes to be a coach, and chances are, they are only one degree of separation away from knowing each other. On the other hand, developing truly meaningful connections in a business where everybody kind of knows everybody can be a challenge. When networking at places like the Final Four, Coaching U Live, NBA Summer League, July recruiting circuit, or even your typical coaching clinic, it’s important to make a memorable impression on those you encounter, and follow up quickly thereafter. FastTrade is available on both the Desktop and iPad versions of FastDraw, and you can include text along with your content. So next time you’re looking to start a new or develop an existing coaching relationship, send a FastTrade along with a nice note. The play you sent your new connection might just turn out to be a game-winning ATO. Pretty sure they’ll remember you for that! BONUS NETWORKING TIP: Another quick and easy way to network with coaches is by sharing FMS content on social media! Tag a coach in one of our Tweets, Facebook messages or Instagram posts. Instagram works great to send via Direct Message. 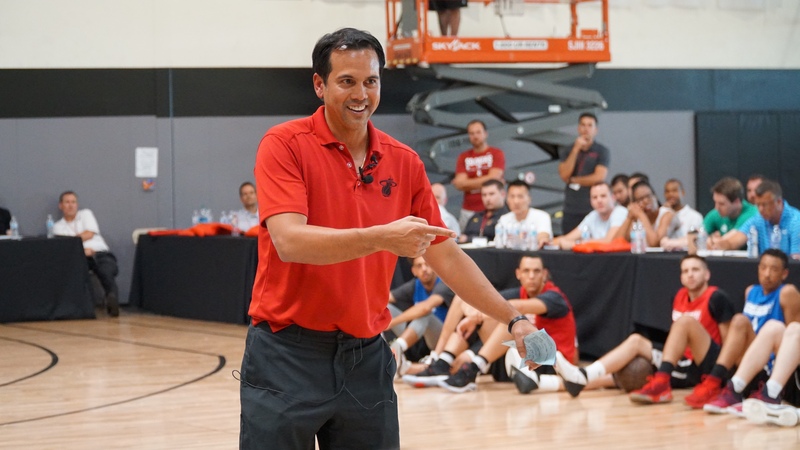 Miami Heat head coach Erik Spoelstra speaks at the 2018 Coaching U Live clinic in Las Vegas, NV. Image courtesy of Coaching U.